Summary: Maddy should have died in a plane crash. Liam should have died at sea when the Titanic sank. Sal should have died in a tragic fire. But a mysterious man whisked them away to safety. 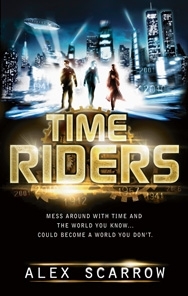 Maddy, Liam, and Sal quickly learn that time travel is no longer just a hope for the future; it is a dangerous reality. And they weren’t just rescued from their terrible fates. . . they were recruited for the agency of TimeRiders created to protect the world from those seeking to alter the course of history for personal gain. By reliving the highly documented events in New York City on 9/11, they can closely monitor history for any deviations—large or small. When just such a change is detected, they are alerted that a threat is at hand unleashing the evil of the Nazis to wreak havoc with Earth’s present and future. Can Maddy, Liam, and Sal fulfill their destinies as keepers of time to save the world from utter destruction? Am I the only person who believes in books standing alone any more? Going through this book I was dead certain that it was going to maybe have a sequel. Was I correct? No. This is book one of a planned NINE BOOK series. 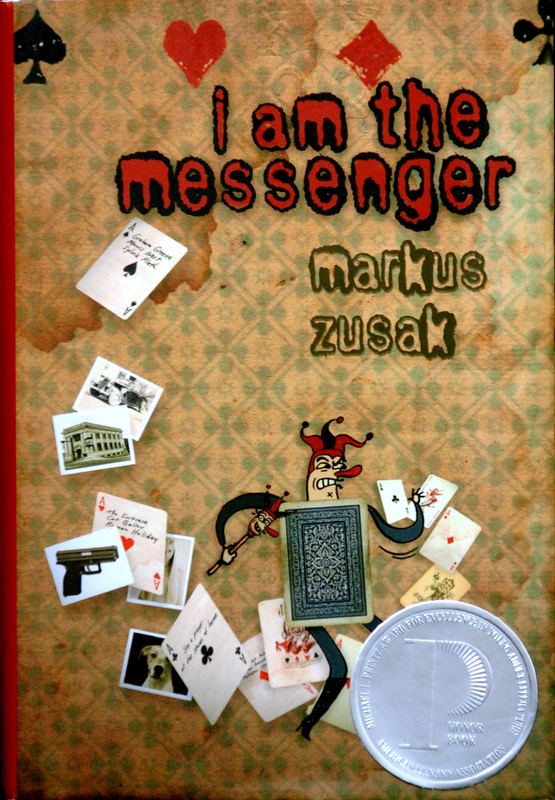 I bought this book from the ‘new arrivals’ shelf thinking ‘heck, it’s markus zusak!’ and then realized that it was originally printed in 2002 and I had a reprint that just empathized Markus Zusak and that he wrote The Book Theif. Thank you, uneducated Barnes & Noble shelvers. Protect the diamonds. Survive the clubs. Dig deep through the spades. Feel the hearts. 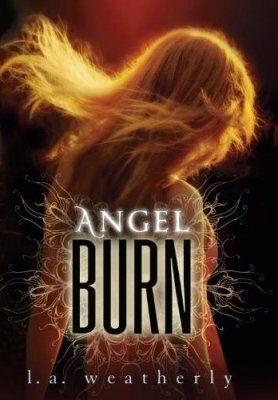 I got this book from the library on the “New Arrivals” shelf because it looked sweet and I like my action-fantasy-romance novels with a dash of politics. Summary: Finnikin, son of the head of the King’s Guard, has been in exile for a decade, after the violent takeover of his birthplace, Lumatere, by a usurper, followed by a curse by a priestess that has effectively shut the kingdom off from the outside world. He meets a mysterious young woman, Evanjalin, who claims that Finnikin’s friend Balthazar, heir to the throne, is alive, and sets in motion a complex and stirring series of events that lead Finnikin to confront his destiny. Evanjalin uses her ability to “walk the sleep” of others, or share in their dreams, as well as her own boldness and sense of purpose, to push events to a climax so that Lumatere can be freed. I’m one of those people that makes lists. And of course, I have a crazy list of “Stuff To Do This Year.” I make one every year, but considering that I’m graduating from high school and starting college and all that, my list is noticeably longer this year. Kristine’s Writing List of 2011! I get that it looks like Midnight Ball... But she seems younger. And freaked out. ﻿Summary: Princess Poppy reluctantly agrees to take part in a royal exchange program, whereby young princes and princesses travel to each other’s countries in the name of better political alliances—and potential marriages. 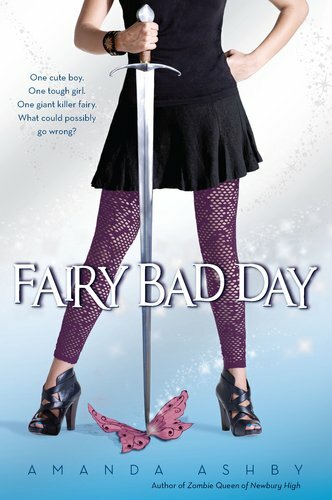 It’s got the makings of a fairy tale—until a hapless servant named Ellen is tricked by a vengeful fairy godmother into competing with Poppy for the eligible prince. Oh, Jessica! Yet again you’ve taken a five minute fairy-tale that’s been done by Disney, Barbie and every idea-stealing scoundrel in between and turned it into a full-length, honestly good novel. Unfortunately, while you PWNED Barbie’s The Twelve Dancing Princesses (still arguably one of Barbie’s best…) in Princess of the Midnight Ball, Princess of Glass was a bit harder to follow than Disney’s Cinderella. I figured this needs a little bit of explaining. Basically, Ashlie told me that our old banner looked really lame so I started tinkering making a new one. Then she asked (demanded) that Prince Caspian/Ben Barnes be in it. Then she said that it would be really cool if we stuck our heads on bodies in pirate-period attire (but in an obviously-fake way so it looks funnier). So I made the BEAUTIFUL banner than now adorns our blog, following that idea. Little bit of explaining: OVER. I’m ALWAYS coming up with new books to write. Like the rest of the world, I dump most of them, or let them fester, unwritten, at the back of my mind, pulled out and dusted off when I’m at my most bored. But I’ve had this one story that I work pretty much all the time, since I came up with it… A year ago? A year and a half? I dunno, the point is it’s been a long time. I spent most of my day blowing off homework to watch Potter Puppet Pals and A Very Potter Musical on YouTube and trying to explain The Deathly Hallows to my dad. Because, let’s be honest: if you haven’t read the book/seen Part 2, there’s no chance you’re going to get anything except the obvious. I was obsessed with HP for a large chunk of my childhood and the movie brought it back a little from the dark storage closet in my brain where I put all of that in my brain after Tonks, Lupin and Fred died. 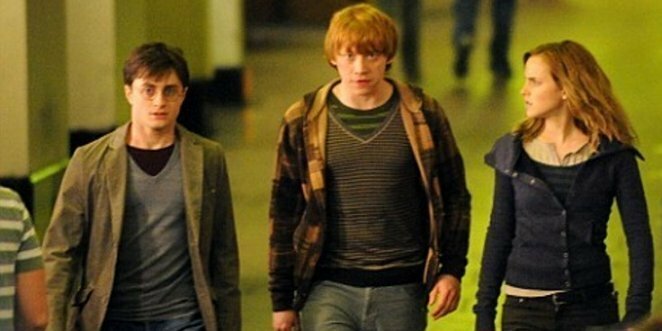 All my favorite people… Why JK Rowling? WHY? But even with all of my shock/outrage, I didn’t really understand Book 7, and seeing the movie, I actually got some of it. And remembered a lot of stuff I just forgot. I want to give a big thumbs up to the people that make those movies. I read an interview at some point where Daniel Radcliff said that it’s not just the books that make the movies a success: they’re actually decent movies. And they are. Especially as the books get more depressing, serious, deadly and confusing, the movies offer a decent step back from Harry’s brain (where everything makes sense) and force the writers to make so things really do make sense. I loved (and totally understood!) the whole breaking-into-the-Ministry part, and Ron’s little melodrama (“oh, no! my wife’s down there all alone!” “Ron, you don’t have a wife.” “oh.”). Although, why did Harry have a glass shard thing with Dumbledore’s face? Was it from that mirror Sirius gave him? How did it appear in his sock? So, I read a whole bunch of stuff I theoretically shouldn’t be interested in. Like Percy Jackson. That’s aimed at kids in middle school. There’re five books in that series and now there’s a new series that’s starting or something… And I’ve read 1, 2, 4 and the second half of 5. And then I read The Lost Hero, which is the first one in the new series. Although it follows the same basic outline (people meet, people find out they’re half-god, people go on a theoretically insane quest and somehow survive to come back and find out ‘hey! you’re not really done because there’s a bigger issue you”ll face in the vague but near future!’) I liked The Lost Hero a lot more. I mean, being in Percy’s head was funny but now there’s three people (all older than he was/closer to my age, too) that we get to see and (gasp!) they all have issues! This is actually a good thing. Because it’s interesting. I’m still mad that Beckendorf and Silena are dead, but Piper is a nice look into the Aphrodite cabin, and Leo living up to Beckendorf’s legacy is a nice shout-out to the fact that he WAS EPIC.